Flexible alternating current transmission system or FACTS is a system which is used for AC transmission of electrical energy and is composed of static equipment and help in boosting control ability and increase power transfer capability of the network. In this project we are going to implement FACTS by thyristor switch reactor and this method is used when charging the transmission line or when there is very low load at the receiving end. The main purpose of this project is to get static voltage compensation under Flexible alternating current transmission system in shunt. This helps in lowering the voltage at the load end that may draw leading current either during charging the transmission line or during low loads. Sometimes it happens due to very low or no load, very low current flows through the transmission line and shunt capacitance in the transmission line becomes dominant. This causes voltage amplification (Ferranti Effect) due to which receiving end voltage may become double than the sending ends voltage and this to solve this, shunt inductors are automatically connected across the transmission line. In this project inductor is in series with the lamp and 2 capacitors are used for producing extra capacitance. Current & voltage transformers are also connected in this project. Whenever load is low and capacitance increased, it is normalized by inductor and normal voltage appears which glow the lamp. This project uses 8051 series Micro-controller, Op-amps, LCD, Shunt Capacitors, SCR, Opto-Isolator, Current Transformer, Choke, Crystal, Slide Switches, Resistors, Capacitors, Transformer, Regulator, Lamp, Diodes in hardware category. Microcontroller is programed using Keil compiler with Assembly or Embedded C language. This project is ideal for Electrical engineers for their final year project or technical festivals projects. If you are good programmer and want to learn new things you can buy this project's do it yourself kit, which comes with all component you required to build this project from tested PCB to Source Code of controller. You can modify the code according to yourself. 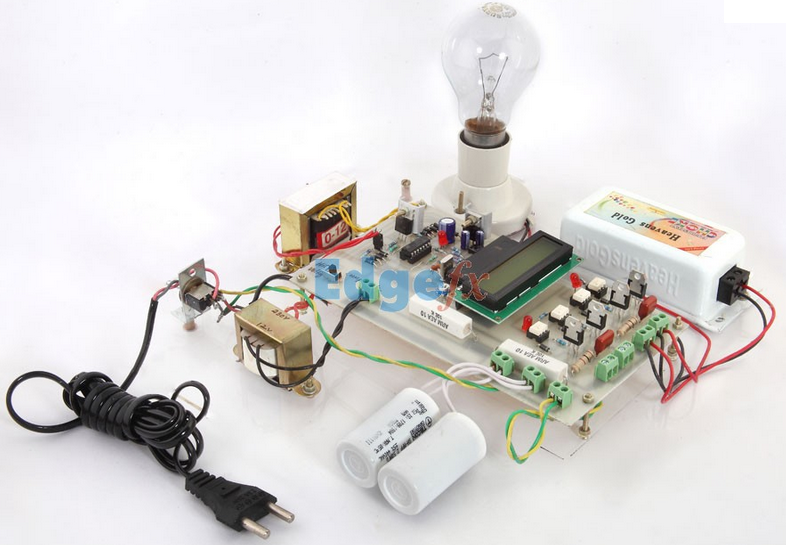 Even if you are not so good in programming or project submission date is near, you can get readymade kit for this project which comes with circuit diagram, full project documentation, source code etc. But I will recommend you to buy Project Kit which is much cheaper then readymade project or DIY kit and you will also learn a lot from it.